At The Library Project, 4 Temple Bar, Dublin 2. With the kind support of the Cultural Service of the French Embassy in Ireland. Introducing the 4th edition of Après Paris, a night dedicated to contemporary Photography with a special focus on Paris’ photographic events during November around Paris Photo. Conceived as an informative event for those who couldn’t make it to Paris, or couldn’t manage to see all the events programmed in November, Après Paris is an evening for all to enjoy. 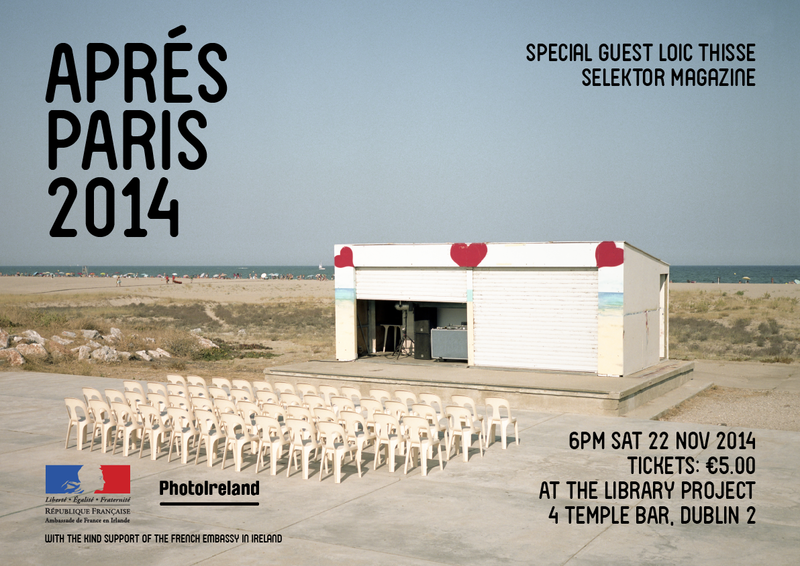 Special guest: Loic Thisse, Selektor Magazine. Selektor is a contemporary photography magazine, a quarterly collection of photographer’s monographs in magazine form. Issue number two is dedicated to Irish photographer Shane Lynam, and it will be presented at Polycopies during Paris Photo and launched in Ireland at Après Paris, at The Library Project. If you are one of the lucky ones to visit Paris, why not bring your spoils (books, flyers, etc.) and share with others that couldn’t make it? We will share all the materials and information gathered too. Next PostGreetings from Ireland: A Call for Works for The Library Project.